Sometimes, while taking in the impeccable execution of a group of ten to twelve-year-old middle school football players, Sean McConnell has to just shake his head and chuckle a little bit to himself. Of course, he covers his laugh, so as not to be seen by one of his little gridders. After all, he is their coach, but to him the scene can be a very funny one. And, as the commercial has made famous, "those moments tend to be priceless." Coach McConnell patrols the sidelines today at West Middle School, teaching his kids, really, more about life than about football. Sure, the Xs and Os are there, but more importantly, it’s the connection with the kids — his kids. It’s a connection McConnell experienced so intensely as a college quarterback at ECU, that he redirected his life and has never once regretted his choice. 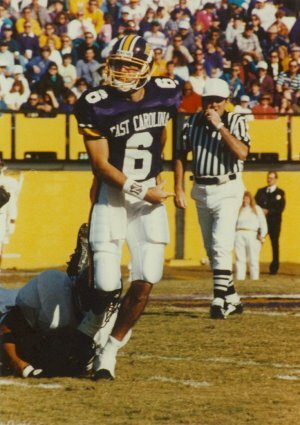 McConnell in his days on the field as an ECU Quarterback. 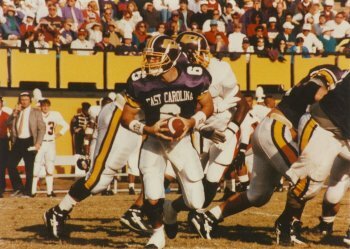 McConnell could very well be forgotten amongst the college quarterback lore at ECU, tucked between the greatness that was Jeff Blake and the lost potential that was Michael Anderson. Yet, McConnell, of the three, etched a name in just 10 starts at ECU through an intensity, diligence, and commitment to excellence that so mirrored quarterback-coach-turned-head-coach, Steve Logan, that if Logan were to put on a uniform to play QB, he would be Sean McConnell. The connections between mentor and student are well illustrated when it comes to Coach Logan, but the one quarterback that may very well be closest to the man in the mirror was McConnell. And Logan’s impact on the quarterback is still very much alive today in the 32-year-old English teacher. McConnell came to ECU via the Junior College route. He was a star at Cerridos Junior College, but never saw himself as a Division I football player. He visited, he fell in love with the school and the program and he went for it. Upon arriving at ECU, his recruiter, Mark Richt, had departed for FSU, and a young star was on the roster in Blake — and there was Logan. But it wasn’t until another Pirate, Joyce Stroud, the long-time administrative assistant to the head coach, and her husband, Butch, recognized the out-of-place West Coaster that McConnell began to feel at home. Three thousand miles from home, McConnell found what today he still refers to as a special situation. For McConnell, ECU was about finding his path in life, a task made easier when a man he respected greatly pointed him in the right direction with some simple words: “I want you to think about being a teacher." And he has never regretted. 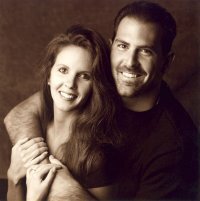 After all, it was teaching that brought him together with his wife of over three years, Deanna. And, it is teaching, that has given him an opportunity to connect with kids in a truly meaningful way — like he experienced with Logan. And his sideline persona today is very familiar. Today, McConnell is where he is supposed to be. And, he credits ECU for putting him there. And a good teacher, too. “212-Scott with Greg Gardill and then moved down to 115-A. (115-A) was the prime dorm, it was the biggest and the easiest to access. Jeff Blake, Ernie Lewis, Shane Hubble, and David Blackwell were all in that suite.